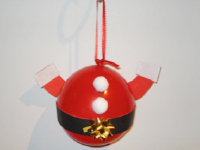 An inflated ornament that can be hung in your Christmas tree. 1. Gather your material. 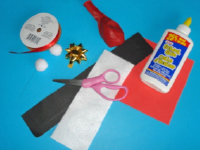 You will need a red balloon, white glue, scissors, a scrap of black construction paper, a scrap of red Fun Foam, a scrap of white felt, a tiny gold bow, red ribbon, and two white pompoms. 2. 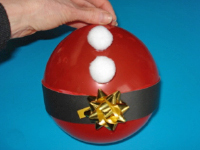 Inflate the red balloon to create a very round shape. 3. 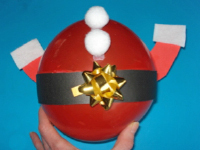 Cut a strip of black construction paper and glue it around the centre of the inflated balloon to represent Santa's belt. Stick the tiny gold bow on it to represent his belt buckle. Glue the white pompoms above the belt, one above the other so they look like coat buttons. 4. 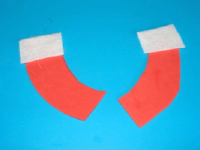 Cut two simple arm outlines out of the scraps of red Fun Foam. Cut two small rectangles out of the white felt and stick them at one end of each arm to represent fur cuffs. 5. 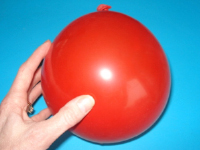 Glue both arms behind the inflated balloon. 6. Cut a piece of red ribbon and knot the ends around the tip of the balloon. 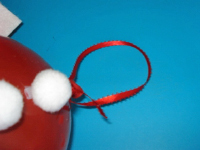 Use the ribbon to hang your ornament.